Press release: Real Life Super Hero Finishes Historic 5,000 Mile Run to Raise Money for Children’s Charities, Becomes First Brit to Run Coast-to-Coast across Canada - Jamie McDonald: AdventureMan, Author, Speaker. Superhero Foundation. 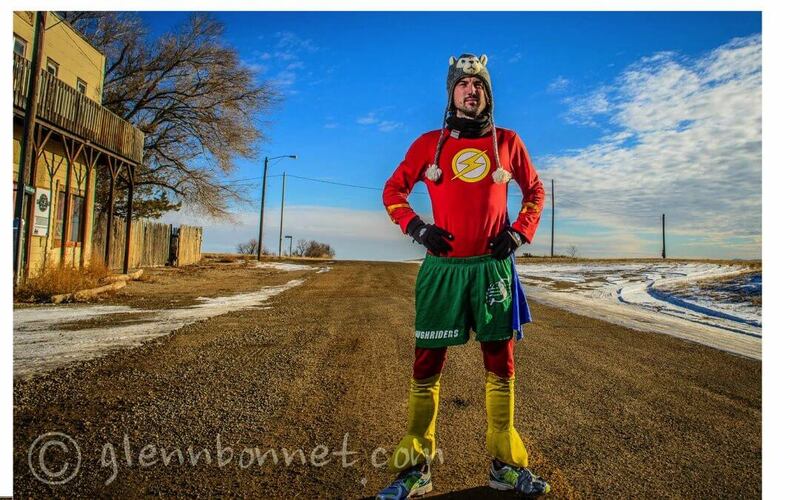 British adventurer Jamie McDonald, dressed as super hero ‘The Flash’, has finally reached Vancouver, Canada, more than 5,000 miles (200+ marathons) away from his start point of St John’s, Newfoundland. In doing so, he becomes the first British person to run coast to coast without a support crew, raising more than $200,000 for children’s charities in the UK and Canada in the process. Jamie McDonald, 27, is a British fundraising adventurer. The Gloucester-born man embarked upon the historic 5,000 mile ‘Run for the Future’ across Canada without a support team in March 2013, to raise money for children’s hospitals in the UK and Canada. Throughout the journey, the UK’s answer to Forrest Gump has battled temperatures of -40 degree Celsius, ran through the Rockies during a harsh Canadian winter, slept rough, been attacked, given motivational talks at dozens of schools, ran for more than 2,000 miles with chronic tendonitis, gone through 13 pairs of trainers, became one of few British people to have been ‘White Hatted’ in Calgary – joining the likes of Prince William and Kate Middleton, permanently injured and misshapen his foot and ran a marathon most days, all to give back to the organisations and hospitals that supported him throughout his own life-threatening childhood battle with illness. World-record breaking adventurer McDonald pushed his 60kg baby stroller ‘Caesar’, carrying all his possessions, for more than 4,500 miles. Jamie began the journey by carrying a 30kg backpack, but had to change tact when the weight caused an injury. As a child, Jamie suffered from a debilitating immune deficiency, epilepsy and a rare spinal condition called syringomyelia that had him in and out of hospital until the age of nine and as such, wished to give back to the hospitals that treated him whilst also supporting new ones in Canada. Jamie’s coast-to-coast run, throughout which he slept by the side of the road or relied on the generosity of strangers, was the equivalent of more than 200 marathons. He used money he’d saved for a mortgage to fund the trip, ensuring 100% of money donated found its way to the causes he was supporting. Jamie ran in aid of a different hospital or foundation in each Canadian province, as well as British charities Great Ormond Street Hospital Children’s Charity and the Pied Piper Appeal, which supports Gloucestershire Royal Hospital, capturing hearts and imaginations as he continued the agonising run across the country. Jamie is inspired by Canadian fundraiser and amputee Terry Fox, who unfortunately succumbed to cancer in 1981 before completing the cross-country run after 3,339 miles, aged just 22. His foundation has since raised more than C$500m for cancer research since his untimely death. “I just can’t believe it’s over,” Jamie said. “I have worked for so long and given this run everything I have, physically and mentally, that to finally dip my hand into the Pacific Ocean eleven months and more than 200 marathons after doing the same thing in the Atlantic Ocean is just incredible. I feel a real mix of emotions. I’m ecstatic that I have finished. I’m honoured to have met so many amazing people in what is truly a beautiful country. I’m humbled by the support people in the UK and Canada have given me. I’m hopeful that my run has and will inspire people to know that we can do whatever we put our mind to. And, of course, I’m sad that it’s over as it’s been such a big part of my life and I’m uncertain about what happens next. In 2012, Jamie cycled 14,000 miles from Bangkok to his hometown Gloucester, England, passing through dozens of countries. Along his journey, he was shot at, arrested at the border and, as with his Canadian adventure, had to sleep rough. Just two days after he finished the journey back from Bangkok; Jamie decided to attempt to break the world static cycling record, which stood at 224 hours and 24 minutes. Jamie pedalled for 265 hours (more than 11 days) in order to break the record. Jamie raised tens of thousands of pounds in the process of both challenges for the Pied Piper appeal. Jamie, 27, is from Gloucester, England. As a child, Jamie suffered from epilepsy, a debilitating immune deficiency and a life threatening condition called syringomyelia. Pure magic and heart, Jamie! You are a *real* superhero. I had the great honor of being introduced to Jamie after he gave a talk at my daughter’s school here in Winnipeg, Manitoba. I was introduce by a friend who met him back in Toronto. He has impressed my daughter, and he is someone she will never forget! I am so thankful for what he has accomplished, and that he finished his year long journey through our Country, give us a piece of his heart ever step of the way. Congratulations Jamie on a job well done, far surpassing the possible. <3 you! Jamie!! We are so thankful to have met you and honoured to now call you a friend! We are in awe of your determination and spirit! We are so proud of you!!! Your hard work, tenacity and genuine spirit are qualities we wish for our own kids to possess. We thank you for showing them anything is possible and to never give up! You will be forever in our hearts and look forward to keeping in touch with you. As Canada has shared your entire journey, we are thrilled to have been a tiny part of it. Please keep in touch! We will miss ya when you are gone from here. Take care bud! Can’t wait to see what you have up your sleeve (or SuperHero costume) next! :) Big hugs and lots of love sent to you today as your FINISH what you started!! Enjoy it and take it all in! You have created something way bigger than you will ever know!! Inspiring!! Just wanted to say a massive well done to Jamie. This son of my city is a hero in every sense of the word, inspirational is too small a word to use. I’m sure the family are very pleased its come to a successful end, we all look forward to your next adventure. We could be looking at a ‘Sir James McDonald’ it would be well deserved. We my hero you have made it, you must be so proud of yourself I am so happy I had the opportunity to meet you here in Marathon, Ontario. Your dad must be very proud of and I am so happy that he is there to see you complete your vision and dream, you have done yourself out for all the children, the families will never forget you for this. Yes I am sure on the other hand you must feel sad that it is over, I loved following your post. I’m in awe. When I first became aware of your goal of running across Canada unassisted I simply thought you were insane. Having followed your progress across Canada via your tracker and having the pleasure of meeting you (and Rich) on the side of the highway in BC I am humbled to report that while you may not be insane you are in fact a superhero. Donation made. I look forward to following your next endeavor. Congratulations Jamie! I take my hat off to you for continuing your run through a Canadian Winter. You are a real inspiration. I wasn’t sure you would manage to keep going when you left Thunder Bay. I can’t believe it is over Jamie! I am so proud of you and proud of our Canada for supporting you the way they have. I am truly going to miss reading your updates and following your adventures in Canada. I think you need to write a book now!!!! Please keep us all posted on what your next adventure will be because I am sure many will want to follow you. You have touched so many lives over the last year, you have no idea how much. Please enjoy your well deserved R&R. I met Jamie on his 27th birthday, on his 100th marathon, in Sault Ste. Marie, Ontario. Ran with him into and out of the “Soo”, and have been following him since. Jamie has inspired me and so many people, that I am planning to continue Terry Fox’s Run from Thunder Bay to the West Coast. I plan to do this in 2020, at the age of 60. If someone has inspired me to do this after all that he has been through, it has been Jamie along with Terry Fox. We are so happy for Jamie, that he has completed his run, but will miss him dearly. Never know, we might need to take a trip to Gloucester. All the best on his next adventure. It truly was a pleasure riding along someone with so much relentless effort very indicative of when life dished it out to you with your illness and you dished it back, by getting back into it. I must admit in a HUGE HUGE way! What an inspiration to the Sick Kids at Hospitals in Canada and back in UK that when they grow up and learn about the man that didn’t give up; they Too, will wish to do something GOOD in this world; Give back like you; and make THAT difference you were hoping for in them! It’ll happen Jamie Mc Donald﻿! It’ll happen! Count on it! There is going to be a Wonderful Wonderful ripple effect from this run CLEAR Across Canada. ***IF there is any “Any” thing I can do from here on it…Please just msge me! I”M ALL over it! Come back for a Rocky Mountain High High with me here in Banff. I’ve been here for some 30yrs, know the area very well, hiking spots,caves, canoe,watching sunrise/sunsets from sleep overs up top the mountains will be well deserved for you! So enjoy your day buddy! Glad your Dad is there along with Rich! Happy Happy times await you! Thanks for doing what you did! There is some kid out there …who can not thank you that I just know you’ve impacted…. ***The Journey is only begun! When one journey is over…. You ARE the Daddy Jamie !!! #inspired. Although I’ve never met you Jamie or talked with you it still feels like you’re a friend about to leave us. Canada going to miss you Jamie. I do hope you come back to visit us again. Jamie McDonald is a truly inspirational person with an enormous amount of courage and determination.He has touched the hearts of millions around the world through his formidable journeys and topped the lot with his breathtaking climb through the Rockies. We are all eagerly awaiting his return to the UK and to give him the welcome and adulation that he so rightly deserves.From his city Fan club in Gloucester,England. You have inspired me to take up running again and forget about all of my worries. Just back from 45 min run and feel great! Jamie: We are so proud of you. The children are truly blessed by your efforts. Take care of your injuries. I know they will not impede you on your next venture. Keep in touch. Coal is still about, aging and forgetful, but still loveable. Keep in touch. God bless you. I also read your article about Kevin. Give him our congratulations also.